Southwest Virginia artist Charlie Brouwer speaks about a sculpture he will be working on titled "Rise Up Chattanooga" outside the Glass House Collective on Tuesday. The sculpture will be made of borrowed ladders and be a symbol of strength, unity and diversity for the Glass Street Community. Attitudes about Glass Street can't change until Glass Street changes. That's the idea behind the most ambitious step yet in the effort to help the East Chattanooga community climb out of the poverty that set in decades ago, leaving half of its residents unemployed and the median household income less than a third of that in the rest of the county. • Sprucing up vacant Glass Street buildings with greenery and planters. • Adding seats to provide rest areas for people walking to bus stops. • Providing more tables and chairs that would invite people outside for coffee or to play checkers and chess. Sketches for the streetscape plan will be unveiled Thursday at a Christmas party hosted by the Glass House Collective, a revitalization organization that was formed this year under the charitable nonprofit Community Foundation of Greater Chattanooga and that is spearheading the revitalization effort. By cleaning up the area, organizers hope that attitudes about Glass Street will change and that businesses such as gas stations and grocery stores will return. Vacant buildings will be lit and busy, and Glass Street will be restored to its former glory. Verlene Middlebrooks is among more than 100 community visitors and residents who contributed ideas for the streetscape plan. She said she believes in the revitalization effort. "People will move into this area," said Middlebrooks, a Glass Street-area resident for 27 years. "People will restore abandoned buildings. This will be a nice place to live." Glass street's decline ran parallel to that of Main Street, said James Moreland, chairman of the East Chattanooga Improvement League. Both were thriving communities in the 1960s, with banks, grocery stores, hardware stores and clothing stores, all the services that were needed without residents ever having to leave the community. Then in the late 1970s came the stores like Lowe's and eventually Walmart, offering lower prices and increased competition. Unable to compete, community businesses began to close. As merchants shut down, the buildings they had occupied were boarded up and, over the coming decades, left to deteriorate. Main Street has come back first. In the early 2000s, people interested in revitalization focused on Main Street and the South Chattanooga area. People got excited, developers started investing and revitalization came. Today, Main Street is home to restaurants, small businesses and even a business incubator. Several condos and loft apartments have popped up nearby. Craftworks Restaurants and Breweries, which includes nearly 200 restaurants including Big River Grille and Bluewater Grille, moved its 100-plus-employee headquarters to Main Street in April. The Center for Integrative Medicine had a groundbreaking Saturday for its new office on Main Street, and a new 17,000-square-foot grocery, Enzo's Market, is set to open next year. Moreland said he expects to see the same pattern with Glass Street and the East Chattanooga community. The traffic is certainly there. Glass Street carries 10,000 to 11,000 vehicles a day and is a direct path from downtown to the Volkswagen plant, according to Glass House organizers. A streetscape plan might seem like a small beginning, but the goal is to fix up as much as possible with limited resources. The streetscape plan will be paid for in part by a $300,000 Artspace grant awarded to the Glass House Collective. Glass House also is seeking other funding sources. Having more people on the street could make the community safer because criminals will know that people are present and watching, said local architect David Barlew, who drew many of the sketches for the presentation. Other renderings were made by designers and architects when American Institute of Architects conference participants visited Glass Street this year. 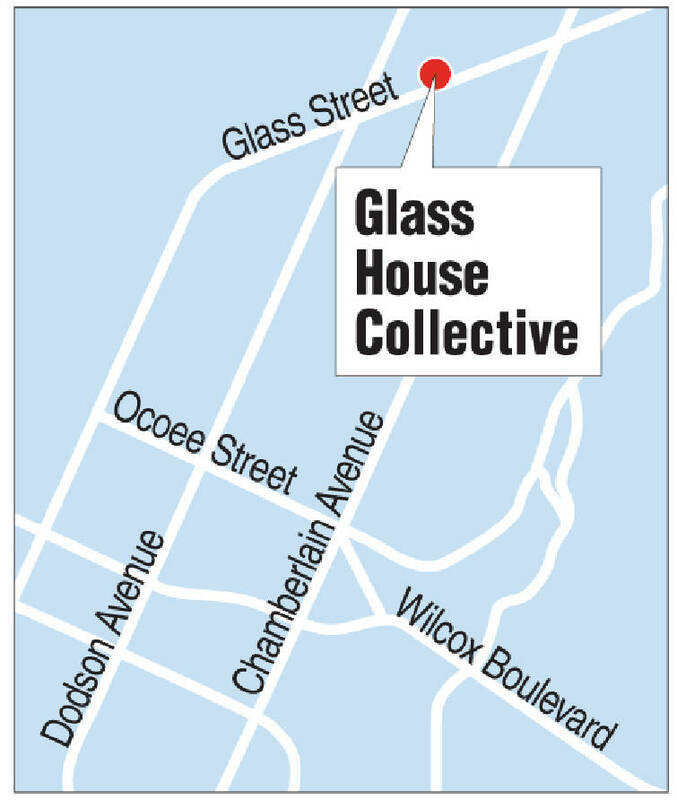 Even before the Glass House Collective came in January, Glass Street residents had organized the Glass Farm Neighborhood Association in 1999 and begun to make progress. They successfully petitioned the city to get a traffic light in January 2002 at the corner of Glass and Campbell streets, once a place of frequent accidents. The association also got more code enforcement in the area to stop people from parking broken-down cars in their yards and got vacant houses torn down. They petitioned from 2001 to 2007 to have more sidewalks built in the neighborhood from the 3100 block of Campbell Street near the Battery Heights Apartments entrance to Stewart Street and got funding for a neighborhood welcome sign, twice because the first time vandals knocked the sign down, residents said. The group says it's excited about the new attention the Glass House Collective has brought to Glass Street. The collective also has commissioned sculptor Charlie Brouwer to build a ladder sculpture that will illustrate the community's unified climb toward improvement. Brouwer and Glass House representatives have started visiting Glass Street-area schools and churches asking their congregations to participate. The success of the sculpture is in getting ladders from everybody in the community, not just a certain population. The idea is to knock on doors, meet neighbors, borrow the ladder for the sculpture and increase the community bond even more when the ladder is returned. Most people borrow a ladder to fix something, get to something out of reach or to improve something in some way. The goal of the sculpture is to illustrate that, said Brouwer. Ladder pickup will take place in February, with work on the sculpture beginning midmonth and scheduled for completion Feb. 23.